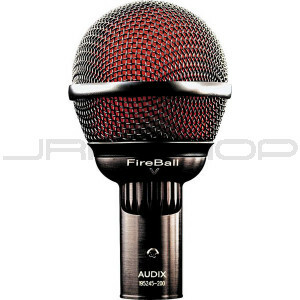 The Fireball is a professional dynamic microphone specially designed for harmonica. It is well suited for both diatonic and chromatic instruments. Characterized with a cardioid pick-up pattern and a smooth, uniform frequency response of 50 Hz to 15kHz, the Fireball will handle both live sound and studio applications. The microphone is clear, accurate, and capable of handling sound pressure levels in excess of 140 dB without distortion. In addition to harmonica, the Fireball can also be used on saxophone, brass, flute and vocals.